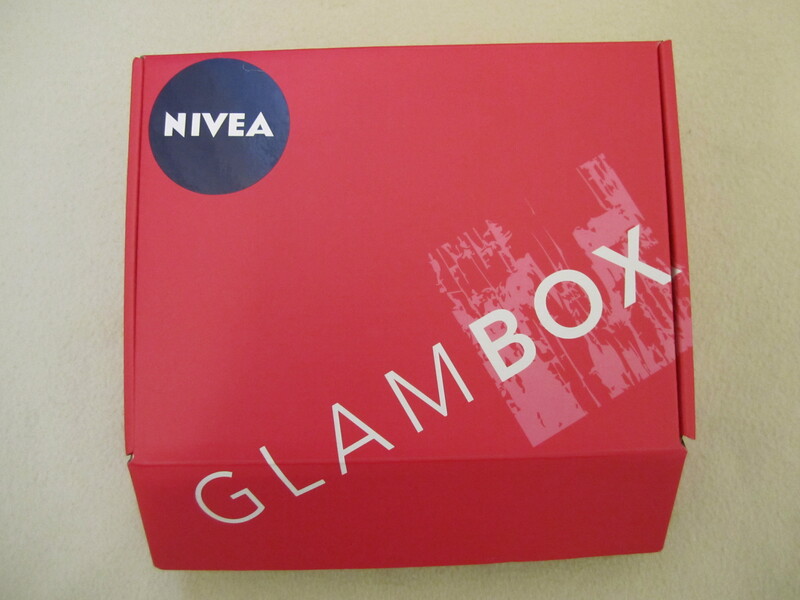 I was so excited to know that the March Glambox was completely dedicated to Nivea, which is one of my favorite brands. It has a Nivea sticker on it. On opening, you will find that everything is so neatly and carefully arranged. A 4ml sample of Nivea’s latest product, Natural Fairness day cream with SPF 30, which promises 10X fairer skin in 10 days. It has Vitamin C derivative (which helps inhibit melanin production for fairer skin), Hydra IQ (which keeps skin intensely moisturized) and Licorice extract (which acts as an anti-oxidant that also helps inhibit melanin production for a glowing even skin tone). Price of this cream (for full size – 50ml) is AED 36. A voucher from Right Bite which entitles the holder to avail 15% discount on their full package – 20 days, plus an initial nutrition consultation! 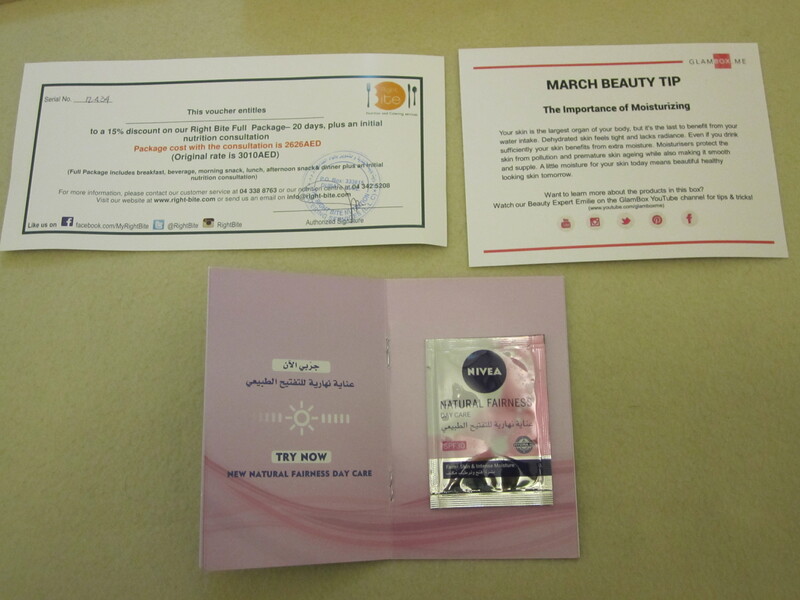 A beauty tip card which Glambox includes with every box. It gives one important tip on one side (this card highlighted the importance of moisturizing) and on the other, lists the contents of the box and it’s prices. Nivea Creme : Who doesn’t love Nivea’s signature cream?. I am sure everyone associates this cream with their childhood!. I just loved the little tin with the hearts on it. This is a special edition produced for the occasion of Mother’s day. For that same reason, I gifted this to my mom along with her Mother’s day gift!. She adored it ♥. This product which contains 60ml is priced at AED4.60. 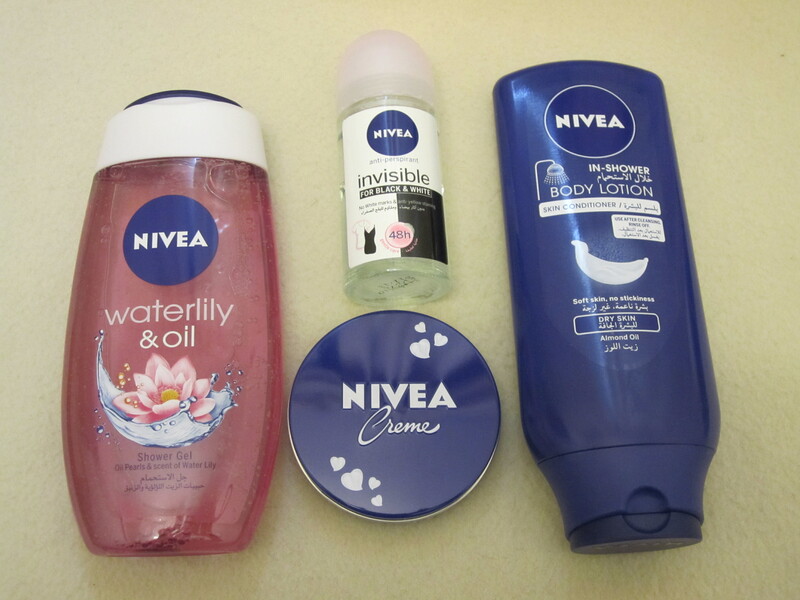 Nivea Waterlily & Oil shower gel : This smells so heavenly! It refreshes your senses with the light, feminine scent of water lily, while the silky fresh gel with pampering oil pearls turns into soft, caring foam – for the unique sensation of fresh, well-cared skin. The oil pearls are tiny yellow pearls suspended in the pink waterlily scented gel. It’s pretty to look at and amazing to feel. Love it!. This 250 ml product is priced at AED12.50. Nivea In-shower body moisturizer : I am so glad that this is included in this box. I already have a backup of this product but now I don’t have to buy this one for a while!. Click here to read my full review, with photos and all. This is one genius product you have got to try!. Price of the 250ml bottle is AED 13.90. Nivea Invisible for Black & White Clear Roll-On : This antiperspirant with 24 hours protection, truly doesn’t leave white marks on dark fabrics or yellow stains on white clothes. I took this with me when I traveled recently. It’s the perfect size!. It has a really elegant, refreshing smell that lingers on for a while. Price of the 50ml bottle is AED10.50. 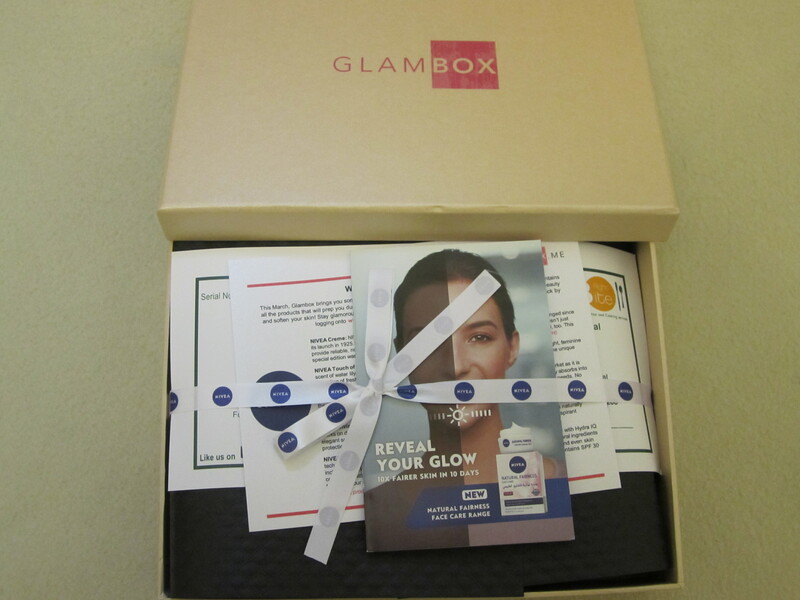 TO SUBSCRIBE TO GLAMBOX, SO THAT YOU TOO CAN RECEIVE BOXES FILLED WITH GOODIES EVERY MONTH, CLICK HERE!! Wanna win this?? : As part of her first blog anniversary, my dear friend, Sally of Giveaways Galore is giving away two March Glamboxes to her followers. Click here to take part! What do you think of the March Glambox?. Leave me comments below. Also, click here to take part in my second blog anniversary giveaway. Ends on April 12th, 2014. Note: I was provided the March Glambox for review purpose and all opinions are 100% my own. ← Book Review: A Beautiful Mourning by Theresa Dalayne! And My dad loves Nivea more than I do. I was not happy with this box but the April box is going to be amazing! I read your review. At first I thought why you didn’t like it then understood that it’s because everything included is drugstore products!. Yeah April glambox is indeed amazing. Review coming soon!